Samosas, with Peanut Sauce, Thyme for Cooking gourmet first course. To the purists, these would be fake Samosas, but we liked them. True Samosas are Indian, usually hot and usually deep-fried. Add hot sauce to the filling if you like. Drain the vegetables well and put into a bowl. Remove 1 sheet of pastry and re-wrap the rest. It's important to keep filo covered at all times or it will dry out very quickly. Fold phyllo in half the long way. Brush top layer with oil. Take one corner and lightly fold it so that the corner touches the opposite side. Do not actually make the fold. We just want to determine the placement of the filling. It will form a triangle. Unfold it and place one fourth of the filling on the half of the triangle that will be the 'bottom'. Now make the fold, taking the corner to the opposite side. Continue to fold over and over, maintaining the triangle, like a flag. (It will make sense when you are doing it) You will end up with a nicely sealed triangle. Brush the top and bottom with sesame oil and place on a baking sheet. Repeat with the remaining phyllo sheets and filling, making 4 Samosas in all. Bake at 400F (200C) for 15 - 20 minutes, until golden brown. Peanut Sauce: Combine all ingredients in a small bowl and whisk well to combine. 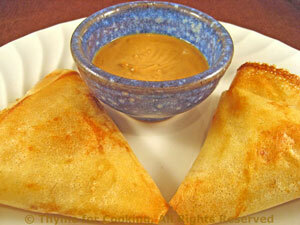 To serve: Divide the Peanut Sauce in half and put into small bowls or on small plates. Add two Samosas to each plate and serve.